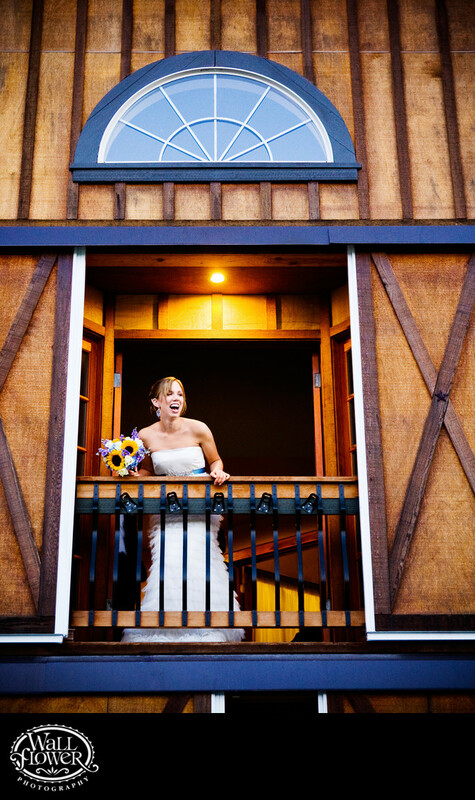 The big Western-style barn provides modern, comfortable amenities for weddings held in this quiet, semi-remote pastoral setting in Stanwood, near the northwest corner of Washington State. It also provides a terrific background and setting for photography. In this photo, the bride is standing on the second-floor balcony, just outside the room where she got ready a few hours before. She's smiling and yelling down to the single ladies gathered below, who are going to try to catch the bouquet that she's about to toss. This wedding was featured in an issue of Seattle Bride magazine.